My dearest foodies, I have to apologise for my absence, my mac had been taken in twice for repair meaning I had no access to any blog photos/photoshop/etc. But here we are, we're back for business! Andrea and I attended a festival at the weekend called EDC in Milton Keynes and whilst we were up there we wanted to see what cuisines it had to offer. After doing some googling - we found three restaurants that we liked the look of. It was between Aqua, Turtle Bay and Banana Tree. They all did different cuisines but we decided that although we eat a lot of Japanese food we both wanted to try pan-asian food. Banana Tree it was. The variation of Indochina dishes were amazing. All things that I find extremely yummy, from ramen bowls to grilled coconut & mango chicken to curries, it was kinda endless and I'm sure anyone could find something off their menu. For starters I decided to try the roast duck spring rolls which were packed full of flavour. Andrea ordered these small dough ball things (that had the same consistency as a doughnut or churros) with a satay sauce - also very lovely. Anything that is similar to a doughnut is a winner for me and if you've followed me from the beginning one of my firsts from the BlueBird I mention about my love for them there! With the spring rolls, there came a little card with instructions on how to make a wrap for the spring roll, you place it in the lettuce leaf and wrap it all up with the carrot and dip it in the sauce. Seriously good. The dough balls came in an abundance. More than I expected for a starter. For drinks, we got the 2-4-1 offer on all cocktails and mocktails so we went for the Wild Strawberry Sparkler which was made up from strawberry syrup, lemonade and passionfruit. Mains I was so stuck on. I wanted to try a salad bowl which just had everything I liked in, crystal noodles, crunchy onion, grilled chicken you name it it was there. 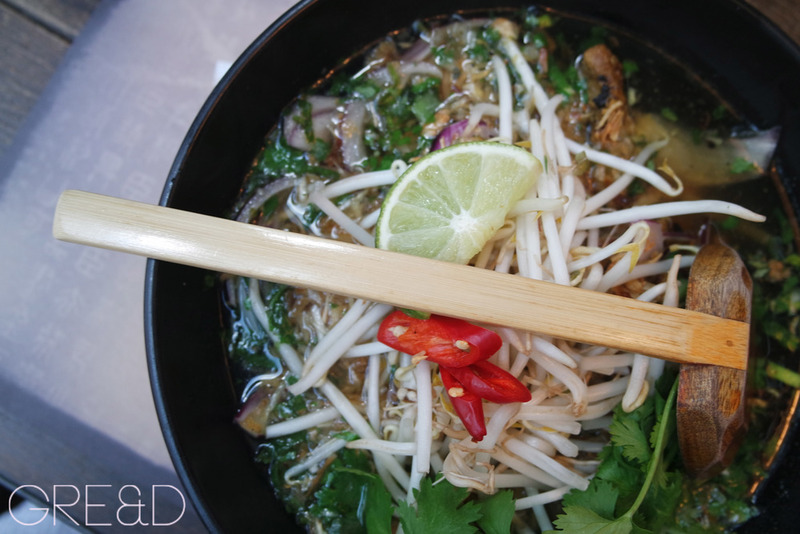 However I decided against it as I wanted something a bit more substantial so opted for the Aromatic Pho which was a huge bowl of broth and rice noodles flavoured with cinnamon, star anise, fresh herbs and chicken. It was a hearty meal and I couldn't finish it all but it was seriously what I needed after the weekend. What I love about asian food is that it is so simple but makes you feel comfort from the warm herbs and spices. 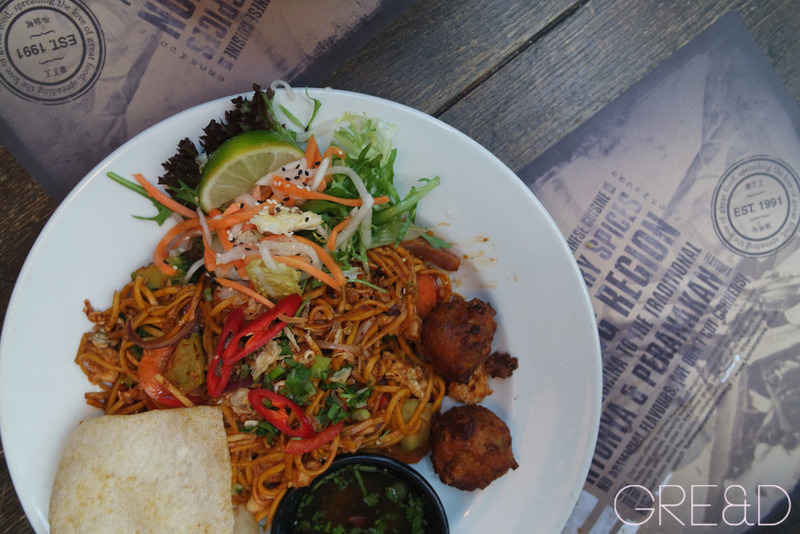 Andrea ordered the Banana Tree Spiced Noodles which had prawns, chicken, eggs, crunchy veg and served with sweetcorn cakes. Again packed with flavour. He also gave me some of his prawn cracker which I was eyeing up over the table! We didn't have dessert as we had to get on the road back home, but they looked pretty good as well having a variety of flavours of ice cream and some Green Thai cakes. I must say the service wasn't outstanding, a little slow but were very polite. What won for me was the decor. by the bar and outside were huge hammock like chairs that you can just chill out on. I would like to go back to a different location and see what the London branches are like to compare, but the food was really amazing and given me some inspiration to cook simialr things at home.